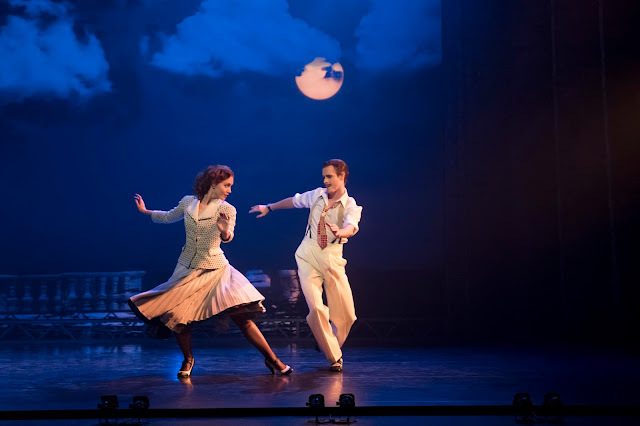 If you're familiar with Matthew Bourne's theatrical productions, you expect a story told without text, only through movement, gesture and music. Oh, and scenery. In fact, the sets, by regular collaborator and designer Lez Brotherston, are so key that they virtually become another character in the cast. This is certainly true for The Red Shoes at City Center, in which a proscenium-within-the-proscenium seems to have a clever mind of its own by the end of the production, and even more possessed with spirit than the eponymous toe shoes. The story, based on a fairy tale by Hans Christian Anderson, revolves around a love triangle between Victoria, a young dancer, the object of affection from both struggling composer Julian and impresario Boris Lermontov, who gives Vicky a pair of red pointe shoes when she is cast as the lead in his new ballet, The Red Shoes. The set design for the ballet is a modern, all-white construction of nesting arches which together comprise a surface to catch video projections (by Duncan McLean). All of the costumes and set elements for this sub-show are in striking black and white except for Vicky's red shoes, which represent the blurring between reality and fiction. While Vicky's success as the lead in the ballet is celebrated, Lermontov becomes jealous of her relationship with Julian, and drives Julian to quit, taking Vicky with him. Although torn, she ultimately chooses to return to the ballet, and in a delirious state, is struck by a train. Tackling the film by Michael Powell and Emeric Pressburger, with music by Bernard Herrmann, is an ambitious task. Obviously, film is without limits as far as settings and editing go. But Bourne and Brotherston do amazing things with Proscenium, spinning it to take us back and forth between Covent Garden in London, and Paris, flipping our points of view between watching the stage, and watching the audience and foregrounded backstage antics. With other scenic changes, we jump to Monaco, the south of France, a dance studio, a salon. At one point, the proscenium's curtain is pulled half open, revealing Lermontov's study (with a kitschy bronze statue of a foot in a toe shoe); it rotates simply and brilliantly to reveal a shabby flat where Vicky and Julian restlessly pace. I caught the cast with Ashley Shaw and Dominic North as the young couple, and Sam Archer as Lermontov. (In some celebrity casting, Sara Mearns alternates as Vicky in New York shows, and Marcelo Gomes as Julian throughout the show's tour.) Shaw impressively evokes the spirit and bearing of the film's star, Moira Shearer. 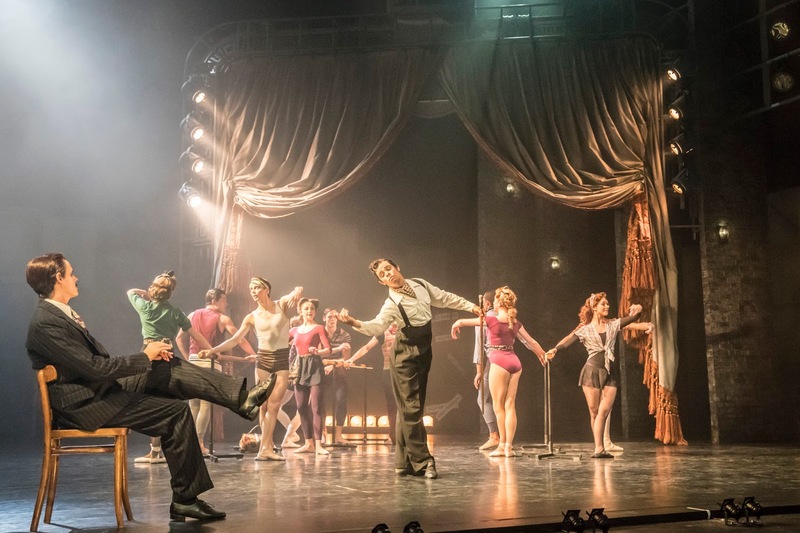 Perhaps more than most of Bourne's past productions, The Red Shoes demands ballet technique of its female lead, although I had to remind myself that most of the ballet is a caricature. It also requires Broadway worthy charisma and projection through physical means alone. And, unlike film's ability to show a close-up (and therefore emotion), we are never very close to Vicky's face, so her body must do the talking. While it is greatly entertaining, there are some weak spots. Character development is hasty and somewhat shallow (in part due to the lack of language), which provides the audience with less reasons to become as empathetic as when watching the film. The front of a locomotive is ferociously frightening in the end scene, if somewhat tonally jarring. And City Center's stage felt somewhat too small for the production, but Bourne is a master of creating high-impact movement with limited breadth. Dancers perch on furniture and stamp, clap and twist, which is echoed in spots around the stage. He uses vertical space as much as lateral, compressing a huge amount of action into a compact cubic area. Bortherston also designed the costumes, flattering 1940s influenced fitted and flared dresses and high-waisted trousers. But it is his Proscenium that steals the show—swiveling, sliding, revealing and hiding the cast members, who dart through it and around it to unravel the story. The Red Shoes is another entry in Bourne's sui generis canon, one that we New Yorkers can only wish to see more of.